Pediatric humeral fractures can occur in several locations including the proximal humerus, shaft (diaphysis), or the distal humerus (supracondylar ridges, medial and lateral epicondyles). Of these, supracondylar fractures are the most common followed by lateral humeral condylar fractures. These fractures can result from a direct hit or a fall onto an outstretched hand (FOOSH). In addition, these injuries occur predominantly in the younger population because their bodies are still in development. Upper extremity fractures are more common than lower extremity fractures in children. Proximal humeral fractures should be the first diagnosis considered in children between 9 and 15 years of age that sustained a shoulder injury. Additionly, this fracture can occur in newborns due to a birth-related injury. Humeral shaft fractures are uncommon in children. If this injury occurs without a major trauma, it should increase the suspicion for a possible non-accidental trauma (child abuse). Lateral humeral condylar fractures account for 12-20% of all pediatric elbow fractures and occurs mostly in children about 6 years of age. 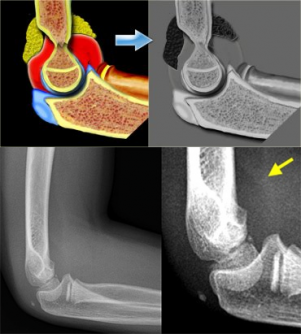 Medial epicondyle fractures make up 11-20% of all injuries of the elbow in children with 30-55% of cases associated with a dislocation of the elbow. Supracondylar fractures comprise 65-75% of all elbow fractures in children. These injuries are the most challenging and have the highest complication rate. Supracondylar fractures mostly occur between the ages of 5 and 10 with the peak incidence occurring between 5-8 years of age (after this, dislocations become more frequent). This injury occurs during this time period due to greater likelihood of falls, general ligamentous laxity, weak bone structure at the supracondylar region, and a joint position of hyperextension. Supracondylar fractures are more common in males and on the non-dominant side. Hyperextension occurs during a FOOSH with the elbow in extension, which indirectly puts force on the distal humerus and displaces it posteriorly; this can occur with or without a valgus or varus force. This ‘extension’ type of injury accounts for 95% of the cases. If the hand is in a supinated position, then a posterolateral displacement occurs. If the hand is pronated, then a posteromedial displacement occurs (more common). Direct trauma or a fall onto a flexed elbow seldom occurs resulting in a ‘flexion’ type injury (5%) with anterior displacement. Appropriate age and mechanism of injury are highly suggestive factors when diagnosing a pediatric humeral fracture. Upon presentation, physicians should screen for neurovascular compromise and always be mindful of non-accidental injuries. 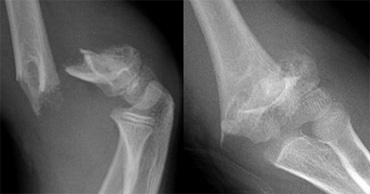 Child typically presents to the ER holding arm straight in pronation and refusing to flex the elbow secondary to pain. Radial head subluxation or nursemaid’s elbow: Patient presentation is similar to supracondylar fracture. The history of traction mechanism with nursemaid’s elbow as opposed to a compression mechanism associated with fractures can help with the diagnosis. 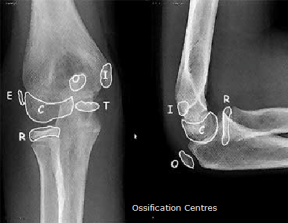 Normal ossification centers at capitellum, radius, medial epicondyle, trochlea, olecranon and lateral epicondyle approximately appear at 1, 3, 5, 7, 9, and 11 years of age respectively. It is important to know this sequence to be able to distinguish a fracture from a normal finding. The ages may vary and ossification centers often appear earlier in females. Currently, there is no standard scale or functional measure used to assess the effectiveness of treatment in pediatric patients with a humeral fracture. Numeric pain rating scale (NPRS), girth measurements, and range of motion (ROM) measurements should be included in the examination and can be used as outcome measures. The Mayo Elbow Performance Scale (MEPS) is a commonly used physician-based elbow rating scale that has been utilized in studies investigating pediatric humeral fractures. Is it a flexion or extension injury? Was the hand supinated or pronated? What is the child’s hand dominance? Any previous injury or surgery to either upper limb? If child abuse is suspected, a referral to the appropriate health care provider is warranted. Localized swelling, ecchymosis, deformity, and other skin changes at the fracture site. Isolated point tenderness over area of humerus that was fractured. Lateral supracondylar humeral fractures tend to present with greater deformity than lateral humeral condylar fractures. Assess radial nerve injury with wrist extension and sensation in the dorsal aspect of the first webspace. Assess ulnar nerve injury with strength testing of intrinsic muscles of the hand and sensation over the palmar tip of the little finger. Allen’s test: To assess radial and ulnar artery compromise due to close proximity to the epicondyles. If posterolateral displacement of the humerus, be highly suspicious of brachial artery injury. White/pale and/or cool extremities indicate arterial compromise, which requires immediate referral to the emergency department. Examination procedures should be performed with caution as the child will experience intense pain and fear during the exam. Reassurance and comfort to the patient and their parent/guardian is important. Interpreting radiographs of pediatric humeral fractures is often challenging due to changing epiphyses during childhood and a child’s cooperation. Standard imaging includes: anteroposterior view with the elbow extended, lateral view with the elbow flexed to 90° and forearm in neutral, oblique views, and images of joints above and below. Baumann’s Angle - Angle formed between physeal line and long axis of the humerus. Average = 72°. Olecranon and medial and lateral epicondyles should maintain an equilateral triangular relationship. Tear Drop - Visible in distal humerus, consists of the anterior line representing the posterior margin of the coronoid fossa and the posterior line representing the anterior margin of the olecranon fossa. Inferior portion is the ossification center of the capitellum. Shaft-Condylar Angle - Angulation of the long axis of the humerus and the lateral condyle. Normal = 40°. Anterior Humeral Line - Line drawn through the anterior border of distal humeral shaft and passes through middle-third of the ossification center of the capitellum. Fat pad displacement - Displacement of any of the three fat pads may indicate an occult fracture. Displacement of the posterior (olecranon) pad is almost always associated with a fracture; whereas, displacement of the anterior (coronoid) alone can occur without a fracture. Posterior displacement of the ossification center of the capitellum in relation to the anterior humeral line is of value in minimal hyperextension of the distal fragment. Gartland’s 1959 classification and its subsequent modification by Wilkins are the most widely used classification systems. 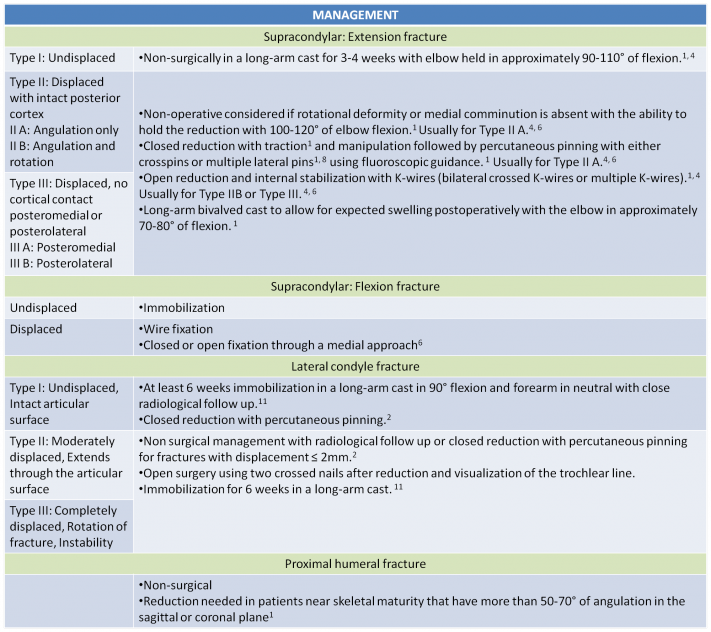 These classifications guide the standard of care for treatment for supracondylar fractures. Additional factors such as radiographic displacement, mechanism of injury, and soft tissue status are considered to determine the most appropriate treatment. Secondary displacement, nonunion, malunion and tardy ulnar nerve palsy. Vascular insufficiency: Seen with Type II and Type III fractures. Emergent vascular exploration surgery is indicated in patients without improvement after orthopedic care, especially if perfusion is compromised or if the patient complains of intractable pain suggestive of ischemia. Delayed release of brachial artery obstruction can lead to ischemic contractions of hand and/or forearm muscles or nerve injury. Forearm compartment syndrome: The extensive swelling has the potential to cause permanent neurovascular damage. Ischemia and infarction if left untreated may progress to development of Volkmann's ischemic contracture. Nerve injury: Neurological injury can result from traction injury or attempted reduction and stabilization. Most deficits are transient neuropraxias which resolve within 2 to 3 months. If they persist, surgical exploration or neurolysis is considered. Cubitus varus deformity: Angular deformity or "gunstock" deformity is a long term complication and is mainly cosmetic. Modern surgical techniques have decreased its occurrence from 58% to 3%. Surgical correction for cosmesis or mechanical symptoms should be delayed until the child has reached or is near skeletal maturity. Myositis ossificans is a rare complication seen after vigorous manipulation. The indications for physical therapy after supracondylar humeral fractures in children are not clear in the literature, even in the presence of an active or passive limitation of elbow joint motion. 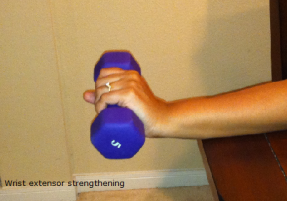 Much of the controversy is partly due to an initial recovery in elbow motion with progressive improvements for up to a year regardless of physical therapy. Physical therapy is not unsuccessful or totally contraindicated. Children who received physical therapy achieved a more rapid return of normal or near normal elbow range of motion. The primary goals of treatment should focus on pain reduction, healing, rapid recovery of mobility, and avoidance of late complications. At two weeks post proximal humeral fracture gentle pendulum and passive ROM exercises should be implemented. For supracondylar and humeral shaft fractures after the cast is removed, passive and active motion, soft tissue stretching techniques, and strengthening exercises should be implemented to maximize functional outcome. Moreover, patient education should focus on instructing parents on how to monitor the child’s neurovascular status, recognize signs of compartment syndrome, and skin care around the cast. Recovery is slower in children who are older, immobilized longer, and have a more severe injury. Lord B, Sarraf KM. Paediatric supracondylar fractures of the humerus: acute assessment and management. British Journal of Hospital Medicine. 2011;72(1):M8-M11. Hart ES, Grottkau BE, Rebello GN, Albright MB. Broken Bones: Common Pediatric Upper Extremity Fractures – Part II. Orthopaedic Nursing. 2006;25(5):311-323. Supracondylar humeral fractures are common in the pediatric population. The child’s age, ossification periods, and mechanism of injury are important to consider. Examining the patient’s neurovascular status is imperative and should be monitored throughout the course of treatment. Stiffness and limited range of motion are common impairments that should be addressed in physical therapy. There is limited evidence for physical therapy treatment and therefore clinicians should implement an impairment based approach. ↑ 1.00 1.01 1.02 1.03 1.04 1.05 1.06 1.07 1.08 1.09 1.10 1.11 1.12 1.13 1.14 1.15 1.16 1.17 1.18 1.19 1.20 1.21 1.22 1.23 1.24 1.25 1.26 1.27 Hart ES, Grottkau BE, Rebello GN, Albright MB. Broken Bones: Common Pediatric Upper Extremity Fractures – Part II. Orthopaedic Nursing. 2006;25(5):311-323. ↑ 2.0 2.1 2.2 2.3 Tejwani N, Phillips D, Goldstein RY. Management of Lateral Humeral Condylar Fracture in Children. Journal of the American Academy of Orthopaedic Surgeons. 2011;19:350-358. ↑ Louahem DM, Bourelle S, Buscayret F, Mazeau P, Kelly P, Dimeglio A, Cottalorda J. Displaced medial epicondyle fractures of the humerus: surgical treatment and results. A report of 139 cases. Archives of Orthopaedic and Trauma Surgery. 2010;130:649-655. ↑ 4.00 4.01 4.02 4.03 4.04 4.05 4.06 4.07 4.08 4.09 4.10 4.11 4.12 4.13 4.14 4.15 4.16 4.17 Lord B, Sarraf KM. Paediatric supracondylar fractures of the humerus: acute assessment and management. British Journal of Hospital Medicine. 2011;72(1):M8-M11. ↑ 5.0 5.1 5.2 5.3 5.4 5.5 5.6 5.7 5.8 Ryan LM. Evaluation and management of supracondylar fractures in children. UpToDate. 2010:1-37. ↑ 6.0 6.1 6.2 6.3 6.4 6.5 6.6 6.7 Marquis CP, Cheung G, Dwyer JSM, Emery DFG. Supracondylar fractures of the humerus. Current Orthopaedics. 2008;22(1):62-69. ↑ 7.0 7.1 7.2 Wu J, Perron A, Miller M, Powell S, Brady W. Orthopedic pitfalls in the ED: pediatric supracondylar humerus fractures. American Journal Of Emergency Medicine. October 2002;20(6):544-550. Available from: CINAHL Plus with Full Text, Ipswich, MA. Accessed November 27, 2011. ↑ 8.0 8.1 Fu D, Xiao B, Yang S, et al. Open reduction and bioabsorbable pin fixation for late presenting irreducible supracondylar humeral fracture in children. International Orthop (SICOT). 2011;35:725-730. ↑ 9.0 9.1 9.2 Kraus R, Wessel L. The Treatment of Upper Limb Fractures in Children and Adolescents. Dtsch Arztebl. 2010; 107(51-52): 903-910. ↑ 10.0 10.1 Mallo G, Stanat S, Gaffney J. Use of the Gartland classification system for treatment of pediatric supracondylar humerus fractures. Orthopedics. 2010;33(1):19. Available from: CINAHL Plus with Full Text, Ipswich, MA. Accessed November 27, 2011. ↑ Marcheix PS, Vacquerie V, Longis B, Peyrou P, Fourcade L, Moulies D. Distal humerus lateral condyle fracture in children: When is the conservative treatment a valid option? Orthopaedics and Traumatology: Surgery and Research. 2011;97:304-307. ↑ 12.0 12.1 12.2 12.3 Keppler P, Salem K, Schwarting B, et al. The Effectiveness of Physiotherapy After Operative Treatment of Supracondylar Humeral Fractures in Children. J Pediatr Orthop. 2005;25(3):314-316. ↑ 13.0 13.1 Bernthal NM, Hoshino CM, Dichter D, et al. 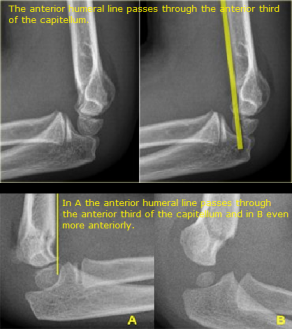 Recovery of Elbow Motion Following Pediatric Lateral Condylar Fractures of the Humerus. J Bone Joint Surg Am. 2011;93: 871-877.